* Only low powered amplifiers, preferably single ended tube amplifiers, can sound really good. * High powered amplifiers can reproduce the full dynamic range of music. * Only tubes can produce the full harmonic envelope of acoustic music. * High bias, Class A operation is necessary for solid-state amplifiers to sound good. * Tube amplifiers are best at creating the illusion of a real acoustic sound stage. Each of the above has been true at certain times in the past and with certain associated components and loudspeakers. We can generally agree that most early solid-state gear was not an advance in sound quality over the tube-based components that they attempted to replace. It was a case of â€œone step forward and two steps backâ€. We gained features and possibly reliability, but the trade-off was too great: those early transistor products often sounded like fingernails on a blackboard. Having mostly lived with tube amplifiers for about 20 years and, over the last year, performed a listening survey of some of the better solid-state amplifiers, I can state with some certainty that each technology has sonic advantages. The quest is, and has always been, to find the perfect marriage of the best sonic characteristics of the different technologies. Tube sound is typically more dynamic â€“ both large scale (macro) and small scale (micro). It is harmonically richer, revealing far more of the fine and delicate structure of every voice and sound, without any sense of grain or harshness. Solid-state sound is usually described as having deep and tight bass and extended high frequencies, with sound that is often marred by a somewhat flat soundstage and usually rendered painfully with grainy and harmonically thin higher frequencies. The better solid-state amplifiers have a wonderful sense of focus that renders an instrument in a very specific point in space and keeps that image intact. 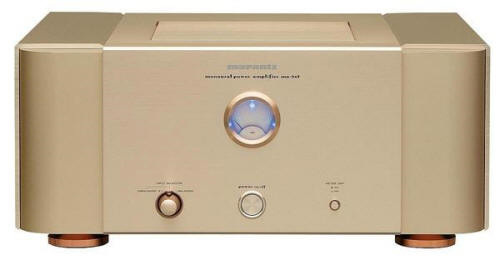 The better tube amplifiers have far superior harmonic development and warmth in the upper frequencies. Over the last few years, the better amplifiers of each technology have begun to sound more and more alike. My preference has been to have the much more satisfying realistic harmonic resolution of tubes and simply accept their maintenance costs and relative sonic deficiency in the bass, however small. Marantz MA-9S2 Power AmplifierThe list above has one tenet that I continue to hold true: high powered amplifiers are necessary to reproduce the full dynamic range of music with most speakers. This became apparent when I changed from the 100 Watt per channel Bella Extreme 100 to the 250 Watt Manley Neo-Classic 250s. Both models are monophonic tube amps. While the â€œBellasâ€ are sonically excellent, early in the audition of the Manleys it was apparent that the latterâ€™s extra power was indeed sonically significant. Most of my listening is in the 10-30 Watt range with speakers of average efficiency. When you realize that a 10 dB peak pushes that power requirement from 30 Watts to 300 Watts, the need for lots of amplifier headroom becomes obvious. My personal â€œmust haveâ€ list for the perfect amplifier includes deep, powerful and high resolution bass, an enormous and accurate spatial environment, richly detailed midrange, and high frequencies that are smooth and absolutely grain-free while preserving the life-like micro detail of such instruments as cymbals, flutes and piccolos, bells, and soprano voices. Add in high power, low maintenance requirements and also, in these â€œgreenâ€ times, low heat output. This is where the Marantz MA-9S2, a 300 watt monophonic golden beauty, weighing 82 pounds with a list price of $7499.99 each, entered the listening room and life of this writer. Review continued on 10Audio.com next….